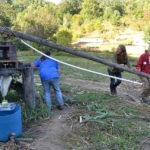 As October brought the relative cool to Marshall, we gathered for our last CRAFT tour of the 2016 season at Doubletree Farm. 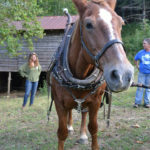 Migrating from Tennessee in 1999 with a team of horses, Cathy Bennett settled in the Western North Carolina mountains and began Doubletree, an operation that produces around 150 gallons of sorghum molasses every year completely from draft horse power. 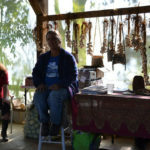 Cathy has scaled down her operation to what she calls the “not fussy stuff,” which means her major crops are garlic and sugar cane sorghum. 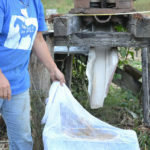 “I discovered [sorghum syrup] production because of the horses; folks would say, ‘Well, if you like horses, you’d probably like molasses…’ The old-timey stuff kind of went hand-in-hand.” She makes a point to differentiate the sorghum syrup she produces and the common blackstrap molasses of the commercial sugar industry. 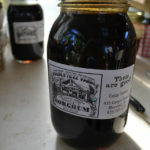 The taste difference is obvious; sorghum syrup has no hints of the bitterness of blackstrap, and is much thinner and more palatable by itself. 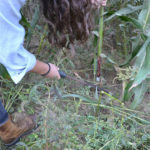 There are many sorghum varieties used for different purposes, including grain, ethanol, and syrup production (Susan of The Lord’s Acre even mentioned they’re growing some this year for Popping Sorghum, a great alternative to popcorn!) 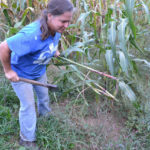 Cathy uses a variety of “sugarcane sorghum”, intended for syrup production. 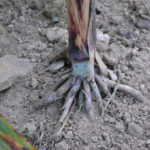 Most of the work on breeding sorghum in this country is being done by the University of Kentucky; Cathy mentioned a variety they have established that produces sterile male phenotypes perfect for a light, lanky stalk perfect for syrup production. These phenotypic characteristics minimize lodging problems common among other varieties. 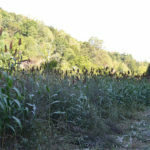 Doubletree grows a ½ acre of sorghum that is planted and harvested two times each year, one harvest at the end of April and the second at the end of September. 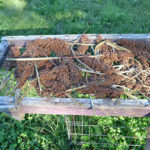 Cathy starts the rapidly-growing sorghum from seed with an Earthway Seeder equipped with an okra seed plate; the plant takes 120 days to grow to maturity in full sun. She plants each row with 40 inch spacing with 8-10 inches between each plant; the Earthway Seeder always seeds heavy, so thinning is important. 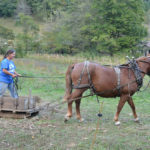 She completes all of the field preparation, planting, and pressing with the labor of her two horses, Bess and Maude, quarter and draft horse mixes. 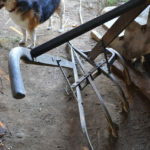 She uses a walk-behind plough called the Oliver 15 and a McCormic Cultivator, which is an Amish make of a single-horse cultivator. 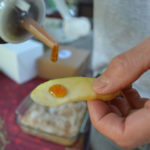 The seeds are “soft and doughy” when the plan is ideal to harvest for syrup. 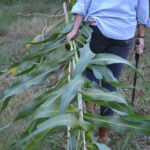 She generally harvests in the afternoon when sugar levels are highest, and completes the whole process by hand with a tobacco knife and machete. 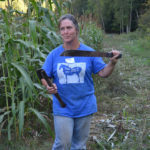 An experienced harvester like herself can complete the harvest of 80 row feet, including the stripping of the leaves and the cutting down of the plant, in 2.5 hours. It takes about 1000 row feet to make 80 gallons of juice, which is the ideal “batch” amount to be processed in Doubletree’s boilers. 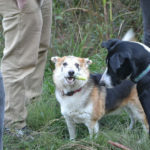 Cathy saves her own seed, which has proven to be effective in combating lodging issues. 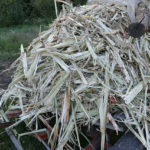 She uses the leaves from the cane in her barn as bedding for the horses, and uses their manure to fertilize the field. 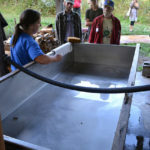 From the field, she delivers the cane to her 3-roller juice mill, which is also powered by the horses. 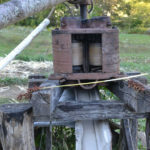 With two horses and two workers (one responsible for feeding the mill 3-7 canes at a time, the the other responsible for checking the filters, switching the horses each hour, and bringing up the cane), a batch of 80 gallons gets pressed in 5.5 hours. 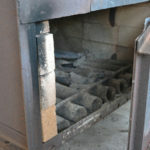 The cooking down of the sorghum juice, which has been drained from the mill down to the sugar house where it is stored in barrels, starts promptly after the pressing is finished. 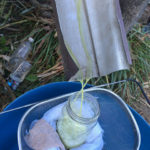 The sweet green juice is cooked at 226 degrees over a firebox below the large evaporator pan, and requires keen attentiveness over the cooking period. The 80 gallons is cooked down, over many hours, to 8 gallons of sweet, delicious, canned product, which Cathy has no problem selling out of every year before Christmas. Sorghum connoisseurs across the world judge the syrup (yes, in official competitions!) 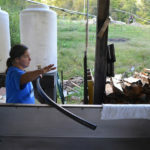 by smoothness, texture, taste, clarity and color; although most commercial producers cook the syrup using steam to evenly disperse the heat so the cooking process can be less closely monitored, Cathy knows cooking over fire is of the elements that produces a superior flavor. 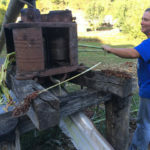 The National Sweet Sorghum Producers & Processors Association holds a convention each year, in Pigeon Forge, TN, which is host to one such syrup competition. 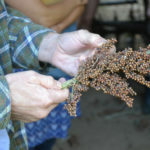 Doubletree offers a 50/50 sorghum crop share, where Cathy, Bess, and Maude, will help you process your sorghum into syrup. If you don’t have enough for a full batch (1000 row feet to make 80 gallons of juice) she’ll match what you have to make one! This would be a great way to see the team in action. 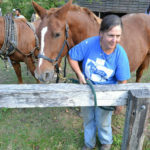 Cathy prides her operation as promoting the idea of draft horses as a way of the future, and not just old-timey romanticism. 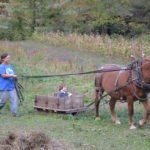 Although she points out that for someone who likes to tinker, antique draft horse equipment is abundant and affordable, she also encourages folks to look into investing new horse drawn equipment being made by many Amish communities around the country. 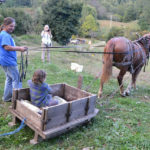 She sees her two horse team as a practical and modern way to approach farm work; they don’t cost much to keep, produce fertilizer for the farm, reproduce themselves and rarely “break down”, and offer a fantastic alternative to fossil fuel dependence. Cathy explains her hand tool choices. Even the pups think the cane’s delicious! 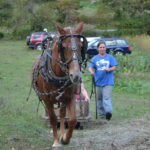 CRAFTers get to work it like the horses do! The pressed juice drains from the mill into our glasses. 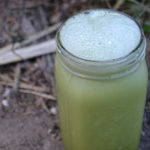 Delicious raw sorghum sweet juice! Sorghum highway to the sugar house. 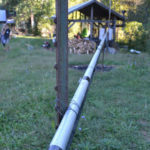 The pipeline from the holding tank to the pan. 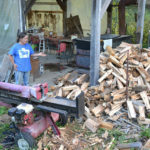 Demonstrating how important it is to keep a healthy stack of wood available! 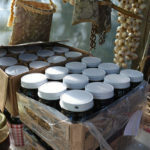 The final product – look for it at French Broad Food Coop! 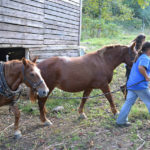 Leading the horses from the barn. 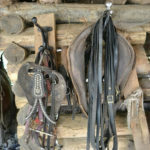 Hitching up the horses for us to meet. 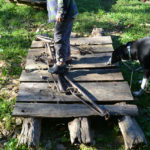 One of the horse-drawn cultivators. 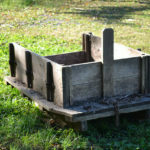 One of the horse carts. Cathy gives the kiddos a ride in the cart.